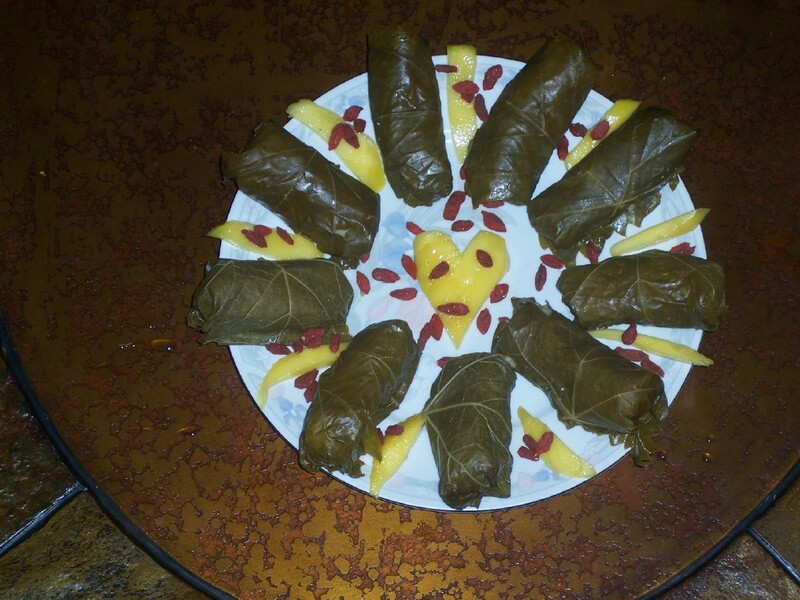 My recipe for Grape Love Leaves. Pinch of dill, oregano, cumin, thyme, garlic, onion, parsley, anise, cayenne pepper and tbsp of salt. Make your rice. After it’s done, put the rice in a big bowl. Then add your goat cheese which is optional. Add walnuts. Cut up one and a half mango into chunks and add it to the rice. Add all seasonings. Stir up well. Put about a tablespoon of mixture in each leaf and wrap them up. Slice left over mango thin for garnish. Lastly sprinkle Goji berries on top of the finished Grape Love Leaves. Enjoy! ← Recipe for Jules Spring Cleaning Smoothie, Yum! I pick and use my own grape leaves. Trick I got from my Greek friends. You can find grape vine growing almost everywhere. The smaller ones are more tender. Thanks Julie! I will look for these vines. Not sure if they are in my area, but I will research around to see. hugs. This looks like something we tried at a greek restaurant. Hubster loves things like this. Though I need to get mangos which are not available where I live, I will try it! Looks yummy! Where do you live? Do you have a Whole foods store near you?